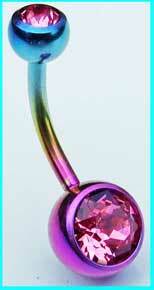 Titanium belly bar with a pretty anodised rainbow finish and matching pink jewelled top and bottom balls. These belly button bars are available in a 6mm (1/4"), 8mm (5/16"), 10mm (3/8") or 12mm (1/2") length. Due to it's nickel free content, titanium is the perfect choice if you have ever had a reaction to surgical steel piercing jewellery. It's also lighter, so is very comfortable to wear too! Powered by ShopFactory to sell P12606 online. All-in one eCommerce and online shopping cart software.